Although the name sounds harmless, it is actually quite devastating to the global citrus industry. 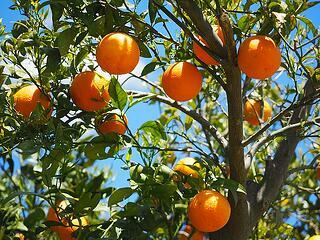 Simply put, it is a disease that is in most cases fatal to citrus crops. Other names for it are yellow dragon disease and HLB. It was first discovered in Brazil in July 2004 and began its global tour causing destruction to every grove it infiltrated. It was first introduced to the United States in 2005 when it was found in a Florida citrus grove. Citrus greening proved itself to be a weapon of mass destruction on citrus groves as the disease began its tour through America. From Florida to Texas to California, this disease carried bacteria from tree to tree eventually causing researchers to take notice and begin devising a solution to combat this major threat to the citrus industry. Since diseased trees did not respond to treatment efforts, detection and prevention became paramount in terms of saving crops. Therefore, researchers needed to know the symptoms of the disease before they could create a solution. The two dominant symptoms were leaves with yellowing veins and slow developing trees displaying mineral deficiencies, like, zinc and iron. Unfortunately, detection had one major limitation. Symptoms did not show during the first year of infection, therefore, the crops and farmers had another enemy, time. Original treatment efforts to fight citrus greening came in various forms. Beneficial parasites were introduced to the trees to create a microbial balance. Heat treatments on trees slowed the development of disease, therefore, buying more time for early research efforts. A zinc-based bactericidal solution was sprayed on crops in hopes to improve the zinc mineral deficiency commonly found in diseased trees. Although providing some improvement, these treatments were only slowing down the disease, but not causing a lasting solution. In order to tackle this issue, researchers had to dig deeper and study the insect that carried the bacteria that caused citrus greening. The results were astounding. Researchers began studying psyllids, insects similar to lice. They researched the reproductive and feeding habits of these insects and made a fascinating discovery. Citrus psyllids possess a protein that makes their bellies blue serving as a physical identifier of a potential citrus greening carrier. Research is showing that these blue bellies could actually be the link to help control the spread of the bacterium. Although there is not yet a cure, this identifier is a win for the scientific community as it allows scientists to isolate the insect infecting citrus trees and understand how these psyllids transmit disease to plants on a molecular level. Additionally, it allows the cure to provide a long lasting solution without using harmful pesticides that damage the environment and the human population.